Note: Apologies for not including any women on the trip in this post. We’re working on a story featuring some of the women that are going to D.C.
More than 100 women of all ages and backgrounds are on their way from Alaska to Washington, D.C. to fight against the confirmation of Brett Kavanaugh to the U.S. Supreme Court. The trip is being organized by the American Civil Liberties Union of Alaska following the national organization’s decision over the weekend to oppose Kavanaugh following the testimony of Christine Blasey Ford and her allegations that he sexaully assaulted her. The national ACLU is reported to be spending more than $1 million opposing Kavanaugh, including ads targeting key votes. A portion of that money will go to flying Alaskans to D.C. to meet with Sens. Lisa Murkowski and Dan Sullivan. ACLU of Alaska spokesman Casey Reynolds said they got word on Sunday night that the national branch would be giving the state a $100,000 grant to fly people out. The outpouring of interest prompted additional people to come forward with private contributions and before long the national organization granted Alaska an additional $100,000 for travel. Reynolds said the precise number of people who will travel to Alaska is still in the works, but said he estimates that around 105 to 110 people from a wide range of ages, backgrounds and experiences will make the impromptu trip. He said there was an effort to ensure that survivors make the trip. Reynolds said the ACLU’s decision to jump into the confirmation fight is particularly notable because the organization’s appearances before the U.S. Supreme Court are only outnumbered by the federal government. Because of that the ACLU has only previously sounded off on three other court nominations. It didn’t take a position on Trump’s earlier pick Neil Gorsuch. 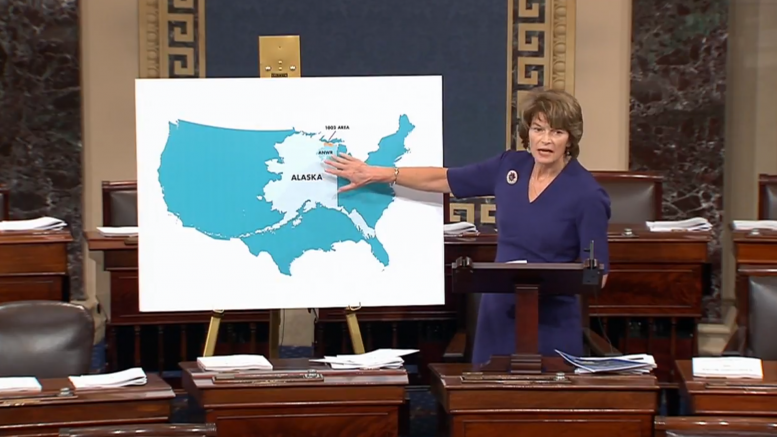 The Alaskans making the trip are expected to meet with both Murkowski and Sullivan before the end of the week, Reynolds said. The U.S. Senate is awaiting the results of a FBI investigation–which was prompted in part by Murkowski–into claims against Kavanaugh. Reynolds said many of the travelers are encouraged by Murkowski’s track record of carefully listening to Alaskans. Murkowski told Alaska Public Media reporter Liz Ruskin earlier this week that interest in Kavanaugh has already outpaced the outreach she received during last year’s consequential health care fight. 2 Comments on "More than 100 women are flying from Alaska to D.C. to meet with Murkowski, Sullivan on Kavanaugh"
I’ll wait for the NRA organized trip in support of 2A. Rule of law, Blind justice, equal rights, Innocent until proven guilty, …yeah right. Do they teach “To Kill a Mockingbird” anymore. Probably too triggering.